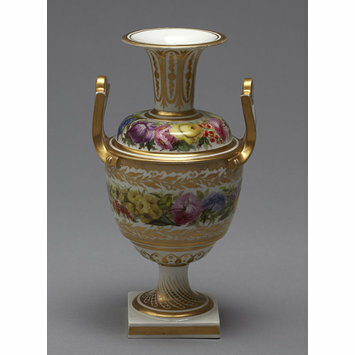 Vase of soft-paste porcelain painted with enamels and gilded. With two openwork handles represented as attached by screws to the shoulder, narrow neck with a flaring mouth, and high foot resting on a square plinth. Decorated with flowers loosely disposed in two wide bands round the middle of the body and shoulder, and with wreaths of foliage and formal designs in gold. One of a pair with C.295A-1935. Formerly in the J. G. Mortlock Collection. 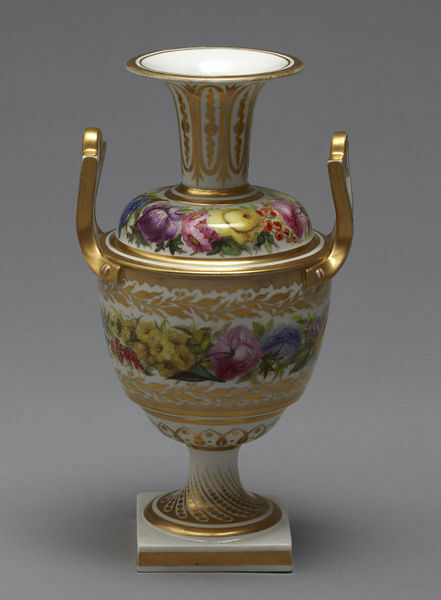 Vase of soft-paste porcelain painted with enamels and gilded, with two openwork handles, probably painted by William Billingsley, Derby Porcelain Factory, Derby, 1790-1795.